There was an elephant in the room at the recently concluded Asia-Pacific Economic Cooperation (APEC) summit in Manila as well as at the East Asia Summit (EAS) and other ASEAN-based meetings in Kuala Lumpur last month: the quiet, potential sway of China-centered initiatives and arrangements on the future of Asian architecture, amid the increasing great power rivalry in the South China Sea. APEC and EAS, of course, are not led by China. Since their creation in 1989 and 2005, these institutions have been, respectively, dominated by the United States and its Asian partners and led by the member countries of ASEAN. However, there are signs that Beijing’s various recent proposals, such as the Asian Infrastructure Investment Bank (AIIB), the “Belt and Road” initiative (Silk Road Economic Belt and Maritime Silk Road), and a host of region-wide platforms, are slowly reshaping not only the extant regional forums but also the broader institutional dynamics of the evolving Asian economic and security architecture in the twenty-first century. The first signs started to appear in 2015, especially after Great Britain, other European countries, and many Asian states (including US allies Australia and South Korea) joined the AIIB as the founding members of what is poised to be a key financial institution in Asia. Fueling the trajectory were the establishment of offshore RMB clearing centers in a string of critical corners around the globe, the signing of bilateral free trade agreements (FTAs) with South Korea and Australia, the growing membership in the Shanghai Cooperation Organization (SCO), as well as the increasing numbers of participating countries at the Beijing-backed Conference on Interactions and Confidence-Building Measures in Asia and the Beijing-led Xiangshan Forum (designed to rival the US-backed Shangri-La Dialogue as a Track 1.5 defense forum in Asia). The International Monetary Fund’s (IMF) decision in early December to include the RMB in its Special Drawing Rights basket, which made the yuan the fifth international reserve currency, is expected to further increase Beijing’s clout beyond its immediate periphery. The Beijing-initiated proposals and arrangements under Xi Jinping can best be described as “an emerging third pillar” in Asian regional architecture.1 While still in its nascent stage, this new pillar is progressively evolving into a chain of institutionalized cooperative arrangements among Asian countries and beyond. The arrangements evolve side-by-side with the existing pillars of the post-Cold War Asia-Pacific architecture, namely the US-led bilateral alliances and the ASEAN-based regional multilateralism. The notion of the “third” pillar does not imply that it is the least significant pillar. Rather, it is the third in terms of sequence of formation. The first pillar can be traced back to the 1950s, while the second pillar has been in place following the creation of the ASEAN-plus forums one after another in the 1993-2010 period. The ASEAN Regional Forum (ARF) was created in 1993/1994, the ASEAN Plus Three (APT) in 1997, the EAS in 2005, and the ASEAN Defense Ministers’ Meeting Plus (ADMM+) in 2010. Neither does the notion suggest that China’s regional activism is new. Beijing has since 2000 spearheaded a number of regional initiatives, such as the China-ASEAN FTA, the ARF Security Policy Conference, and several sub-regional economic proposals (e.g. Pan-Beibu Gulf Economic Cooperation). It has also actively supported key regional mechanisms like the Greater Mekong Subregion (GMS), the Chiang Mai Initiative (CMI, 2000) and the CMI Multilateralization (CMIM, 2010). Nonetheless, its earlier regional activism (with the exception of the SCO and the Six-Party Talks) mostly took place within the second pillar, i.e. the ASEAN-centered platforms. Xi’s regional initiatives, by contrast, have been promoted primarily outside of the ASEAN-based framework, even though China has continued to take part in all of the ASEAN-centered institutions, as evidenced by its active participation in the series of regional meetings in Kuala Lumpur the past few months. What exactly does this emerging third pillar mean for Asia? Whether, and if yes, in what way is it shaping the regional architecture, through what processes, and at what levels? To what extent have the changing dynamics thus far prompted ASEAN states to recalibrate their strategies? More specifically, does the recent conclusion of the US-led Trans-Pacific Partnership (TPP) (of which China is not a member), negotiations—along with the concurrent strengthening of US defense ties with its allies and partners under Obama’s rebalancing strategy—mark the consolidation of the US-led first pillar? Does the lack of concrete progress in the China-backed 16-member Regional Comprehensive Economic Partnership (RCEP) (in which the United States is not included) negotiations—as well as the lack of clear support for Beijing’s Maritime Silk Road initiative at the regional level—mark a setback for China-centered regional arrangements, as suggested by some media analyses? Finally, does ASEAN’s decision not to issue a joint declaration at the recent 3rd ADMM Plus mark a failure of ASEAN cohesion and centrality as the second pillar amid the growing power rivalry? I offer a preliminary analysis on the above issues. I contend that the key to evaluating the progress and prospects of the Asian architecture should not be confined to the temporal status of one or two arrangements at any diplomatic forums, but also longer-term trajectory and evolving institutional dynamics at the macro level, in order to better make sense of the changing patterns on the ground that may have an impact on Asian states’ policy choices. Regional architecture is defined here as the embodiment of all institutionalized region-wide arrangements—including alliances, institutions, and networks of bilateral and sub-regional development clusters—that are underpinned by sets of organizing principles and the power structure at the macro level, upon which regional countries seek to pursue cooperation and manage conflict in a pattern. Based on this conception, I argue that the China-backed initiatives and platforms are reshaping Asian regional architecture in at least two aspects: the evolving institutional fabric and the power foundation of Asian architecture. The emerging China-centered initiatives and arrangements are shaping the institutional fabric of Asian architecture by gradually developing a hub of loosely linked but continuously expanding cooperative mechanisms among regional countries, alongside the existing US-dominated alliances and ASEAN-led institutions. While bilateral and sub-regional development clusters are not new in Asia (e.g. bilateral FTAs, the GMS, the “Growth Triangles” among key ASEAN countries), the current China-centered arrangements take a distinctive form: a network of regional, sub-regional, bilateral, and sub-national economic (and to a lesser degree, security) clusters originated and driven by a rising power’s preferred organizing “principle,” whose developments are institutionally supported and synergized by multiple interwoven mechanisms (e.g. bilateral connectivity projects such as the Maritime Silk Road), and financially boosted by autonomous funding sources (e.g., the AIIB and the Silk Road Fund). These features make China-backed initiatives and arrangements a relatively independent institutional pole of Asian architecture, notwithstanding their still nascent stage. They have been built upon China’s earlier—albeit less interconnected—regional platforms (e.g., the SCO and Boao Forum for Asia), and have evolved in tandem with newly created mechanisms (e.g., the Xiangshan Forum and the China-ASEAN Maritime Cooperation Fund). At present, the China-initiated proposals and platforms have appeared to focus chiefly on regional connectivity and related activities as a focal point of the third pillar. These include infrastructure development, inter-port cooperation, investment links, currency collaboration, maritime cooperation, and industrial parks involving China and neighboring countries, particularly ASEAN states, with which China has enjoyed long-standing and increasingly close economic ties. ASEAN has been China’s third largest trading partner since 2011, and China ASEAN’s largest partner since 2009. Thus far, the ASEAN-China connectivity cooperation process has been taking place at multiple levels. At the regional level, progress has been made chiefly in the form of the creation of mechanisms (e.g., the ASEAN-China Connectivity Cooperation Committee, the China-ASEAN Port Logistics Information Center, and the China-ASEAN port cities cooperation network) and declaratory support for projects like the Nanning-Singapore Economic Corridor. What is relatively overlooked, but perhaps more important—at least at the current stage—is connectivity processes at the bilateral and sub-national levels. Indeed, since Xi Jinping’s announcement of the Maritime Silk Road during his visit to Indonesia in October 2013, much of the concrete progress has taken place at these two levels. Examples are the China-Laos high-speed railway project, the China-Thailand high-speed railway project, China-Indonesia cooperation on the Jakarta-Bandung high-speed railway project, the China-Malaysia twin industrial parks in Qinzhou (in China’s Guangxi province) and Kuantan (Malaysia’s Pahang state), as well as Guangdong province’s cooperation with Malaysia’s Malacca state, with an eye to develop a deep sea port in Malacca and revive its historical status as a major trade port in Asia. Through such mutually beneficial connectivity projects, China pledges to build “community of common destiny” with its Asian neighbors. It hopes to make the geography-based and remuneration-driven “common destiny” a credible organizing principle to complement and compete with the threat-based “collective defense” (that underpins the US-dominated alliances) and norm-based “cooperative security” (that underpins the ASEAN-based regional institutions) in shaping the direction of Asian architecture. Regional connectivity, of course, is not necessarily the most important domain that will determine the future of the Asian order. But it is one of the multi-level processes on the ground that will, over time, have knock-on effects on the evolving patterns of trade links, investment flows, people-to-people movements, financial and functional cooperation, and, perhaps, also political ties. These are all elements that define the fabric of any regional architecture, the interplay of which shape the foundation of the emerging regional (and global) order. For Xi’s China, regional connectivity (and the wider Belt and Road initiatives) gives the rising power an opportunity to provide regional public goods while serving a number of external and internal goals. These include: mitigating the structural pressure of the US rebalancing strategy; expanding economic links with geographically closer neighbors to compensate for the reduced commercial opportunities in the traditional US and European markets after the 2008 global financial crisis; channeling demand for the production surplus of its steel and cement industries; rebalancing its own development; diversifying its energy sources; promoting RMB regionalization; and cultivating deeper regional interdependence to offset the adverse effects of its continuing maritime assertiveness in the South and East China seas, thereby striking an optimal balance between performance legitimization and nationalist legitimization. This evolving institutional fabric, in turn, is slowly shaping the underlying power structure of the regional order, with effects that may complement and potentially challenge the existing two pillars of Asian architecture. Take the various regional connectivity projects (being proposed or implemented in stages) that Beijing has framed as part of the Maritime Silk Road, which include the construction of railways, roads, ports, and pipelines as well as the development of sister-port coalitions and economic corridors involving China and neighboring countries. These projects—either partially financed or largely funded by Chinese capital—are likely to help intra-ASEAN connectivity or individual ASEAN countries’ own infrastructure development in the immediate terms. Some, like the Singapore-Kunming Rail Link (SKRL) and Lancang-Mekong Cooperation (LMC), are being promoted under the ASEAN-China cooperative framework, specifically, ASEAN-China connectivity. These, along with China’s continuing involvement in other ASEAN-based activities, generally contribute to the centrality of ASEAN-led institutions as the second pillar of Asian architecture. As more and more Beijing-initiated, Beijing-funded connectivity projects are being promoted outside of the ASEAN-China framework, the geo-economic and ultimately geopolitical sway of China-centered arrangements is likely to grow. Over time, this third pillar will grow at a faster pace, wider scope, and greater impact than the second pillar, with China as a hub—if not the hub—of Asian connectivity (and related region-wide cooperative activities), to the extent that all forms of “roads”, literally and figuratively, may, one way or another, lead to Beijing. This is not inconceivable, given China’s sheer size, its growing capital, and its lead location in the wider Asian regions. The AIIB, headquartered in Beijing, once taken off, is likely to provide substantial institutional impetus to China’s status as a hub of regional and inter-regional cooperative mechanisms. China-centered initiatives and arrangements are also posing challenges to the first pillar. Already, the lure of AIIB has created a divergence in the perceptions of interests and policy actions between Washington and its allies across European and Asian capitals. Of course, the allies’ decisions in joining the AIIB and other China-led arrangements are driven primarily by a pragmatic calculation to maximize economic benefits (the AIIB, Jakarta’s choice of China over Japan on the Jakarta-Bandung high-speed railroad) and perhaps to display deference (attending Xiangshan Forum, agreeing to China’s suggestion to have the informal ASEAN-China Defense Ministers’ Meeting in Beijing) to the rising power; the decisions do not mean that they are bandwagoning with or kowtowing to Beijing. Nonetheless, the slowly emerging divergence of perceptions and interests among the United States and its allies on these and other practical moves (e.g. Australia’s military exercises with China, Park Geun-hye’s attendance at Xi’s military rally in Beijing) may well be a taste of things to come; because of the dual pull of China’s geo-economic clout and its long-term geopolitical influence that is partly derived from a perception of China’s seemingly unstoppable rise, more and more countries—not just US allies and partners in Asia but even its key allies in Europe, such as the United Kingdom, Germany, and France—are showing signs of greater readiness to accommodate Beijing. They demonstrate greater deference especially on issues China considers vital to its interests. Hence, the Thai, Cambodian, Malaysian, and Indonesian governments have collaborated with Beijing to deport to China Uighur Muslims who fled ethnic tensions. Leaders of many ASEAN states, even those increasingly alarmed by Beijing’s growing assertiveness or dominance (e.g., Vietnam and Myanmar) chose to attend the military parade in Beijing in September 2015 celebrating the seventieth anniversary of the end of World War II, despite the US absence. The United Kingdom and other European powers have refrained from meeting the Tibetan spiritual leader Dalai Lama in recent years, reversing their earlier position. As the third pillar continues to grow, the readiness on the part of US allies and partners to defer to China (albeit selectively) is likely to increase. Their tendency to pursue policies toward Beijing that are somewhat independent of Washington is also likely to deepen. Over time, these may erode the foundation of US-Asia ties, undermining the long-held dominance of the US-led alliance system as the first pillar of Asian architecture. These possibilities, however, remain remote, at least for now. China’s continuing assertiveness in the South China Sea has made its pledge to build a “community for common destiny” in Asia an empty slogan at best and hypocritical rhetoric at worst. In the eyes of the regional countries, Beijing’s continuing construction of islands and facilities in the disputed waters is contradictory to its own notions of promoting “interdependence,” “mutually-beneficial” relations, and “common security” among Asian countries, the very principles stressed by Chinese leaders in almost all regional gatherings. Instead of using its remuneration-based arrangements to woo regional countries and compete with the US “collective defense” arrangements, China’s own actions have made the first pillar an even more indispensable option for weaker states in the region, even though many of them remain concerned about the sustainability of the US rebalancing policy. At the same time, they have also persisted in not taking sides, while working to uphold ASEAN cohesion. Hence, during the recent ADMM Plus meeting in Kuala Lumpur, when China opposed the inclusion of the “South China Sea” in a joint declaration whereas America refused to support a declaration that excluded any mention of the disputes, ASEAN decided not to issue a joint statement in order to project its neutrality and unity. While it is unclear if this can be considered the ASEAN states’ effort to pursue “group hedging” in the face of a growing power rivalry, what is certain is that the growing US-China competition is exerting greater pressure that risks polarizing the region and marginalizing ASEAN’s role as an inclusive platform for managing regional issues, thereby undermining ASEAN centrality in regional affairs. The continuing rise of China-led initiatives as the third pillar and the US determination to push back are likely to color the evolution of Asian architecture in the years to come. 1.Cheng-Chwee Kuik, “An Emerging Third Pillar in Asian Architecture? 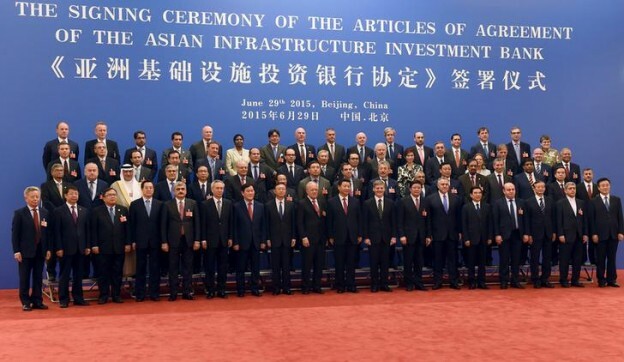 AIIB and Other China-led Initiatives,” Asia Pacific Bulletin, no. 305 (Washington, DC: East West Center in Washington, March 26, 2015).